In 2018, a New York man died of cancer in conditions which were far from unique. The man wasn’t able to decipher when his cancer symptoms first appeared, because allegedly, his EHR did not accurately display his medical history on progress notes. The patient had a suspicion that the integrity of his medical records was not being maintained, which ultimately led to his death. Claiming breach of ‘fiduciary duty’ and ‘gross negligence,’ the estate of the deceased patient filed a $1 billion lawsuit against the EHR company. This isn’t the first brush healthcare has had with lawsuits over complicated technology. One patient’s blood pressure plummeted dangerously after being prescribed the wrong medications. Another suffered irreversible damages because his test results and diagnosis were delayed by days, only because the EHR at the clinic and the lab system didn’t completely interface. Another patient lost her life to a brain aneurysm which went absolutely undetected because the scan that was ordered through the clinic’s software system never made it to the lab- it was never transmitted. Which brings us to a sad and exasperating truth. Technology was introduced to healthcare to enhance its progress, improve the efficiency at which care is delivered, and make people healthy. Instead, we have deaths by a thousand clicks- and it’s happening every day. It’s not about sloppy technology. Not anymore. We expected healthcare technology to work like a magic charm. We wanted it to assist providers in delivering high-quality care, make populations healthier and safer, and control the skyrocketing cost of care. After 96% of non-federal hospitals and 86% office-based physicians implemented them, Electronic health records (EHRs) were regarded as storehouses of big data that could reveal intricate details into patients’ health and be the foundation of an electronic ecosystem. Rather than that, EHRs have become a sprawling mess of broken bits of data. Physicians, the ones who didn’t even choose or design these systems, have been left to wrestle with the unfriendly technology of EHRs instead of interacting with their patients. Healthcare was then introduced to data warehouses and platforms that claimed to simplify access to broken pieces of data- which they did, to an extent. These solutions could successfully house disparate data, but the confusing and clunky interfaces just added to the number of clicks. Overall, it wasn’t just a hundred or two, we’re talking about 4,000 mouse clicks made by an average ER doctor over the course of a shift. 4,000 clicks and zero errors? The probability of that happening is small. Has technology eliminated the ‘human’ in healthcare? In the efforts to digitize healthcare, technology has ended up birthing more problems than it actually solved. 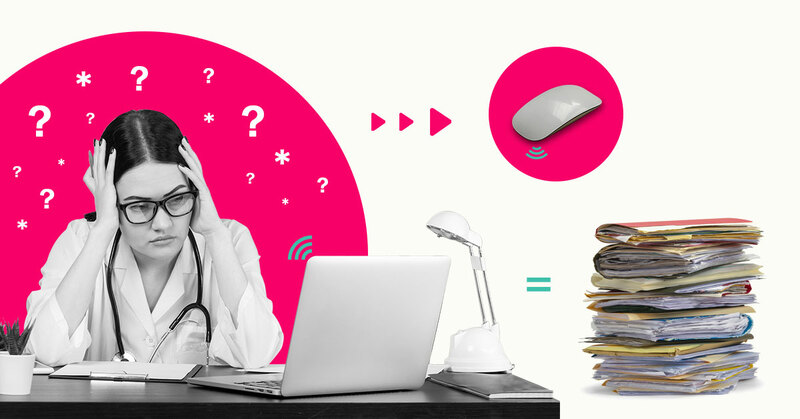 Disconnected data systems are no less than a ticket to misdiagnoses or wrong prescriptions. The patchwork of systems that don’t talk to each other results in more missed lab tests that were ordered, or worse- delayed care. Not to mention how data, even aggregated, won’t tell the complete story unless someone puts two and two together. Most of all, complicated technology is compromising with the way health care should be delivered. In a patient encounter that lasts a little over 10 minutes, physicians spend most of the time typing away on their computers, addressing the needs of the EHR and not the patient. Nearly half the day, 49.2% to be precise, goes into paperwork including updating their EHRs and documenting the quality measures- compared to 27% of their time seeing patients. Much like texting while driving, this results in misdiagnoses and poses a significant patient safety risk. It’s not too late to revive healthcare. Let’s right the wrongs! Healthcare providers should not be subjected to a series of endless prompts and checkboxes that demand click after click to order a simple test. An organization’s decision-makers should not wrestle with a ton of data to understand the health of the population they serve. Patients should not struggle to receive their medical records or the care they rightfully deserve. It’s time we made these processes simpler and allow activated data to tell us the complete story, and tell it transparently. Much like your credit card transactions, stakeholders should be able to view the changes in their patient’s health in real time. Much like a pizza you get delivered, providers should be able to see the progress of their patient’s care plan. And much like how you access your tax records or bank transactions or frequent flyer miles, patients should be able to access their healthcare records just as simply. The two things that can actually make a difference are reducing the number of clicks to gather information, and having it delivered at the right time. Healthcare technology needs to be what we envisioned in the first place- user-friendly and efficient enough to make a difference. We’re stepping into a new age of healthcare, and technology shouldn’t be the one thing holding us back- not when we have just started gaining momentum.